This module started out as one of Maureen's husband John's projects. He put the wood work together ("never again" he says), and then started to play around with the track and wiring. The fun then began. At first, he didn't know what he wanted to do on the module, but after seeing a photo of a drive in movie theatre with a railway line going past it he decided that that was what he was going to do with it. An iPod was purchased and movies were down loaded onto it, and then he went about making a holder out of styrene to hold it so it looked like a movie screen. He purchased a projector booth and then he put it aside to work on other much needed modules. This is where I come in. I have always wanted to do my own module, but every time I have come up with an idea someone else has also had a similar idea and I had to think about something else. At the 2011 Qld Model Hobbies Expo (http://www.qmhe.com/), I decided I was going to do a military scene. I decided that I was going to use a single module, and do a small scene of the two straight tracks at the front, and behind it a small hill with trees and undergrowth. Hiding in the trees was going to be German or English soldiers around a gun ready to fire it towards the tracks. When I had a good look at home for what I could use, I started to find our old 1/144 and 1/160 scale tanks and military vehicles. John suggested that instead of a single gunner, maybe I should do a small museum display. This would enable me to display on the module any style of military vehicles and not to have to worry about the 'rivet counters' saying that I have the wrong gun with the wrong soldiers. While I was waiting for him to build my module base, I started to put the tanks and bits up onto the blank inside corner module to see what I had to buy. That is when I decided that the single module would not be big enough, and that I would have to put it on a larger one. A couple of days later, I decided to tell John of the change. He said that I could use the inside corner, so off I went to have another look at it. To my shock, John had actually done something to it; it was no longer a blank base board, but was now green. He decided that he was not ready to use it just yet, but it was going to be used in show layouts, that he would put some ground foam on it to make it look better. (He could take it off later when he wanted to use it). John's putting grass down helped me out a bit. It saving me from doing it. All I had to do was remove where I wanted to put the roadway. My son Luke helped me with the scenery. He mixed the paint for the roadway and laid it for me, then I did the rest. I played around with the fence. It was originally going to be a chain link fence but after looking at the module I decided that an iron fence would be better. I enjoyed raiding the scenery bits box for the wood to build the frame, and I used pre-made iron that I got for another project that I never did and went about making the fence. I have learnt a lot doing this fence and will make the necessary changes on one that Luke wants me to make for his. We have found a lot of small bits on the internet which is making the module more a one off. 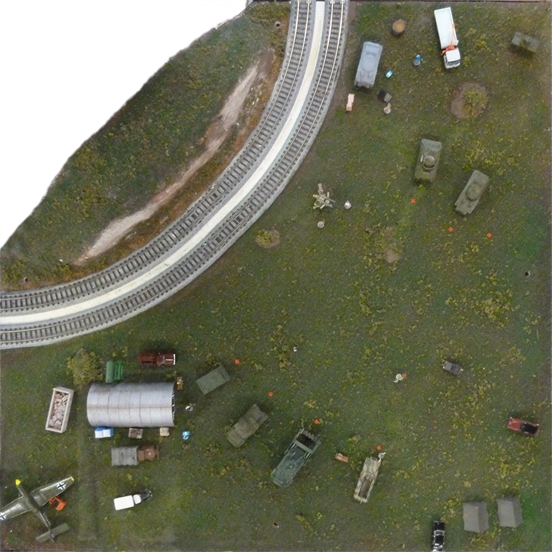 A small static track was laid on the module so the members can put their military wagons on it to display them, thus meaning the module will always be changing. The big test for the module was at the 2012 Qld Model Hobbies Expo. This is where some of the best model builders (all styles) from all around Australia (and this year from New Zealand) come to enter their static displays in competitions to see who is the best in Queensland. There are a lot of military exhibits there so it was going to be interesting to see how it went. Success, I had a lot of great feedback about it and a lot of photos were taken. The module is not finished yet as I still want to play around with putting one more building on it and then decide where the vehicles are to go and glue them down properly. I am thinking now in extending the scene using a double module and putting on it a small airfield like the one at Emu Gully near Gatton. This will enable us to display the planes that John and Alvin's dad had collected.